Interview by Lori Bizzoco. Written by Stephanie Sacco. 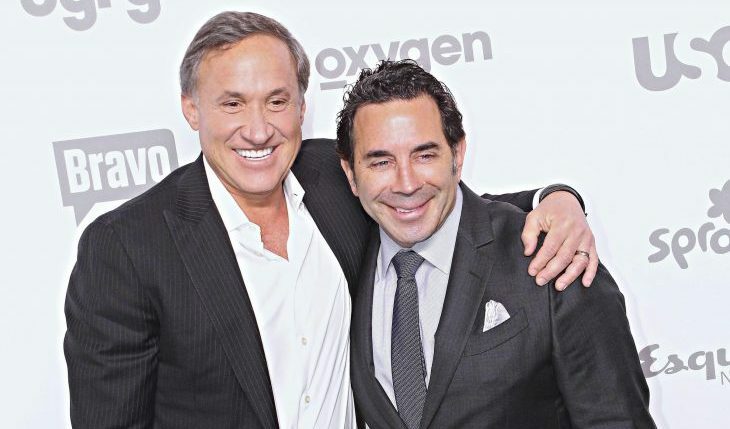 Dr. Paul Nassif is more than a doctor on reality TV. He’s a renowned facial plastic surgeon and skincare specialist. Though people may remember him from The Real Housewives of Beverly Hills, he’s even more recognizable for his E! reality series, Botched which he co-hosts with former RHOC star, Dr. Terry Dubrow. The success of Botched has even led to a few upcoming spin-off shows, Botched By Nature and Botched Post-Op. Last week, Nassif spoke to us in an exclusive celebrity interview about the upcoming spin-off shows, his new anti-aging skincare line and his very single relationship status. Back when Nassif first developed the concept for Botched and pitched the show, his co-host was doubtful, calling Nassif “crazy” for wanting to put plastic surgery on TV. “Now look at us,” the former RHOBH star says. Botched is in its third season and the show has led to multiple spin-off series. One of the many reasons for the show’s success is that all the cases are legitimate, and Nassif and Dubrow are passionate about their clients. The doctors really enjoy helping their patients through their issues. Nassif says the role of a plastic surgeon is “part doctor and part therapist.” Although extreme cases are common in this line of work, the reality TV star shares that the worst is yet to come. “For me personally, once you see the episodes of Botched By Nature, those are going to be the most riveting and the hardest cases we’ve had to do,” he admits. One of the differences between Botched By Nature and Botched is the client’s reason behind getting plastic surgery. “Some people got struck by lightning, went through severe accidents, and had deformities,” the plastic surgeon says about the spin-off series. This brings the doctors even closer to the clients. “You really get into the heart of it by going into these people’s homes,” he shares. “You see their families and loved ones, and you’re allowed to discuss these incredible human interest stories about what they’ve had to go through their entire life.” That added personal layer is something the fans haven’t seen before. Due to the extreme cases that they’re dealing with, Botched By Nature has the surgeons on the road, traveling all over the country. But it’s not all serious business. The two friends have some adventures along the way. Nassif explains, “We’ll be going to different parts of the country and doing something fun in each city.” Being on the road has its perks and these two won’t disappoint. “You’re going to see more of a reality between Dubrow and I because we’re traveling. So you get to see a little bit more of that bromance,” Nassif says. Though he’s always been successful in the operating room, Nassif hasn’t been as successful with romance. He admits that he isn’t dating anybody right now and that he’s found that dating takes a lot of time and energy. “I cleared my slate so I could come home, work out earlier, and get more sleep. Dating is fun, but it’s very taxing,” shares the father of three. He’s already been a part of a celebrity couple for many years, and he isn’t interested in having it again at the moment. While his career flourishes, he’s putting his love life on hold and is focusing on his new skincare line. The NassifMD Bio-Rhythmic and Bio-Clock Dermaceuticals skincare lines are out already, and Nassif uses the collection. When asked how the products differ from others on the market, he explains that he has an understanding of the face and body, and is qualified to know what works. “As a plastic surgeon, I look at skin differently than a dermatologist,” he says. Botched By Nature premieres on August 3rd at 9/8c. You can follow Dr. Paul Nassif on Twitter and watch Botched on Tuesdays at 9:00 on E!